Based on our recent survey the number one thing members value most about their Chamber membership? NETWORKING!…the opportunity to connect to over 500 local businesses. Now that’s a powerful membership benefit! Join by Friday, 8/17 during our Membership Drive and get 15 months membership for the cost of 12 months! Top Concern Facing Your Business! Our recent member survey identified a top concern facing businesses…hiring qualified workers. The Chamber is driving collaboration among local schools and business leaders to identify the workplace needs and facilitate discussion among guidance counselors, teachers, parents and students. Joining the Chamber helps support workforce development. Membership drive continues until August 17th. 15 months of membership for the cost of 12 months! Lasting Impact of Chamber Events! Chamber Events Have a Purpose & Long Lasting Impact! With the recently wrapped up Street Festival & Sidewalk Sale and the upcoming September 8th Taste of East Aurora, I just wanted to briefly talk about the longer lasting impacts these events have on our community. 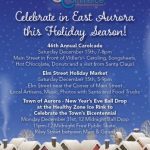 Beyond the immediate day of sales & dollar impact and the tens of thousands of visitors and shoppers that are drawn to East Aurora, these events have a longer lasting effect on our local brick and mortar businesses, other participating vendors and the community at large. So you see there is more than a 6 hour event that closes Main St. to traffic and may be an inconvenience to some. There is longevity to the event that carries on throughout the year that offers businesses an opportunity to take advantage of and that benefits the community in more ways than most people think! Chamber Membership Drive Starts Monday, August 6th! Chamber Seeking Nominations for Awards Event! The Greater East Aurora Chamber of Commerce is seeking nominations in various categories for their 73rd Annual Business Recognition Awards, Tuesday, September 25th at the Roycroft Inn. These awards recognize significant contributions to the Greater East Aurora community by businesses, organizations and individuals. “SHOWCASE AWARD” – A Chamber member business that has shown growth in sales or employment and/or has made a significant contribution to their industry and/or has had an impact on the local Greater East Aurora economy. “HAPPENING AWARD” – An organization holding an annual event in Greater East Aurora that draws a significant audience, promotes the area and has a positive impact on local businesses. “JOURNEY AWARD” – A member business, organization or individual that has played a key role in promoting tourism in Greater East Aurora and/or works as a partner with other local businesses to promote local tourism and/or is a “role model” in the hospitality industry, i.e. customer service, cross promotion, etc. “EXCELLENCE IN SERVICE AWARD” – An employee of a member business that exemplifies the highest degree of customer service. “VISIONARY AWARD” – A Greater East Aurora business, school, association or individual that promotes student preparation for the workplace by acting as an advocate for workforce development issues, career technology education and the skilled trades and/or plays an active role in partnering with other businesses and schools in supporting career exploration activities, i.e. internships, business tours, mock employment interviews or support of employability portfolios. 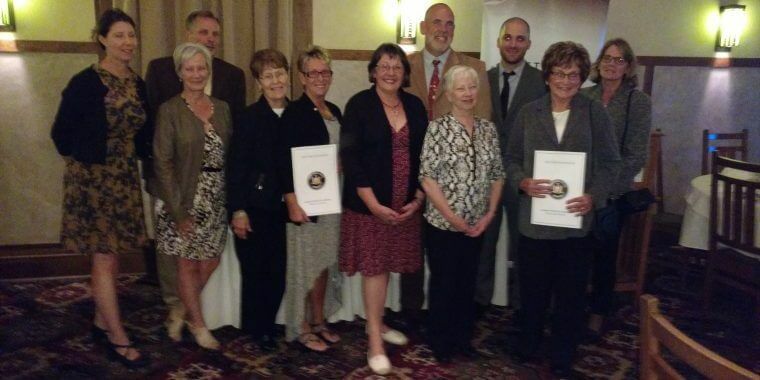 “CIVICS AWARD” – An individual(s) who has contributed significant support to a Greater East Aurora not-for-profit or service club for the betterment of the GEA community and its residents. “LEGENDS AWARD” – Representing the Chamber’s Hall of Fame induction that features an individual, business or organization that has had a long standing impact of 50 years or more on the GEA community. “EDUCATOR OF THE YEAR” – In keeping with the Greater East Aurora Chamber of Commerce’s Business Education Alliance mission statement which is – To develop partnerships between our business and education sectors to better prepare students for the work place – we continue to recognize educators in the East Aurora, Holland, Iroquois school districts and the Ormsby Educational Center to honor them for their dedication toward their students’ success in the workplace. Event Title Sponsors include Bene-Care, Fisher-Price, Bank on Buffalo, Benderson Development, Bank of Holland, Bright & Brainy Creative Marketing, Marilla Country Store, Surdej Web Solutions, The Bonadio Group, West Herr Buick, GMC, Cadillac of East Aurora – Event Supporting Sponsors include Aurora Audiology & Speech Associates, Comfort Funeral Home, Independent Nursing Care, Moog. Nominations and a brief explanation in support of the nomination are due to the Chamber office at 652 Main St., eanycc@verizon.net by Friday, August 17th. For further information or questions contact the Chamber office at 652-8444 or eanycc@verizon.net . Thanks for Support for a Successful Street Festival & Sidewalk Sale Event! Chamber Thanks for Sidewalk Sale Support! 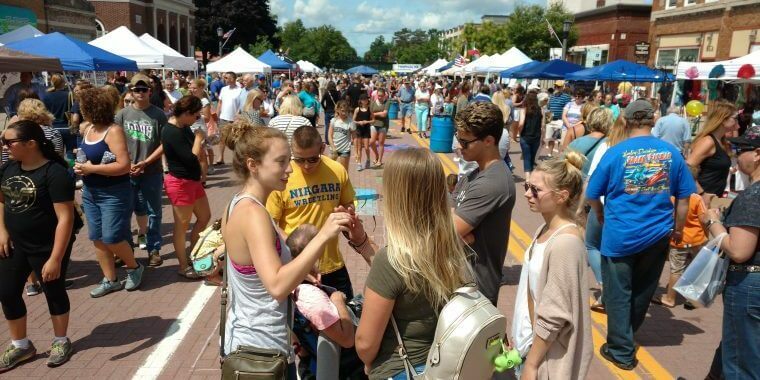 There’s not enough room in this forum to recognize everyone individually who helped make the 49th Annual Greater East Aurora Chamber of Commerce Street Festival and Sidewalk Sale such a success on July 28th, but we’re going to give it a try. Special thanks goes out to West Herr – Buick, GMC, Cadillac for their continued support as title sponsor and to each of our many supporting sponsors including Seneca Health Center, Bradley Tree, University Pediatric Dental, The Bonadio Group, Tops Markets, Hidden Valley Animal Adventure, Buffalo Spree, Astronics, Bright & Brainy Creative Marketing and Home Entertainment Group! Thanks also to the Village of East Aurora, our event volunteers, the American Legion Color Guard, I-61 Church and Fisher-Price for the use of their parking lot which helped in lessening some of the parking congestion. With the help of these businesses, individuals and organizations we were able to create an event which drew thousands of people (and from open to close this was the best attended street festival we have had!) from around WNY to support our local businesses. Events like ours not only draw people in for the day but we hopefully provide such a great experience that they keep on coming back again and again. And a great experience we provided! We’re very fortunate to be able to showcase such a tremendous village and our businesses and we look forward to seeing everyone next year for a significant 50th anniversary event! Join us for the excitement! 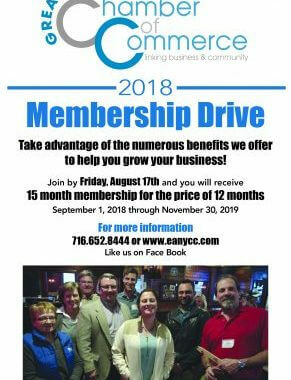 The week of August 6th the Greater East Aurora Chamber of Commerce will kick off a membership drive to encourage local business owners to join the Chamber. The Chamber has many offerings that can help businesses grow. Businesses who join by Friday, August 17th will receive 15 months of membership for the cost of 12. This special incentive will insure membership from September 1, 2018 through November 30, 2019. During the drive Chamber members and staff will proactively reach out to new businesses and those that may have been involved with the Chamber in the past to introduce and remind them of the many benefits the Chamber offers. There are the direct benefits such as networking, referrals, and business after hours events that members use to actively gain new customers and there are the less tangible benefits such as tourism promotion and workforce development that the Chamber and its members are actively involved in. A recent survey of members found that a large percentage of respondents highly value and utilize the Chamber’s membership directory. “Even in this digital age we have found that many members and consumers still like to use the membership directory to find other businesses. All our members are listed in this directory for no additional cost,” stated Gary Grote, Executive Director of the Chamber. In addition to these and many other membership opportunities to take advantage of, businesses will also be supporting an organization that has played a significant role in the development of the Greater East Aurora community we enjoy today. Current Chamber members can also benefit from this membership drive by referring a business to join and receiving a 20% discount on their membership renewal. For further information on how to join visit the Chamber website at www.eanycc.com . Also contact the Chamber office at eanycc@verizon.net or 652-8444. Like us on Facebook and see how the Chamber promotes current members! Parking Available at Riley St. Lot for EA Street Festival & Sidewalk Sale This Saturday! Special thanks to Fisher-Price for use of their Riley Street lot at the corner of Girard Avenue and Riley this Saturday for the Annual East Aurora Street Festival and Sidewalk Sale. The lot will be open at 7am for vendors and visitors to the July 28th event. Stop and visit over 100 vendors on the closed portion of Main St. between Olean Rd. and Riley St. from 9am to 4pm. For further information contact the Greater East Aurora Chamber of Commerce at 716-652-8444. In mid-May the Greater East Aurora Chamber of Commerce distributed a membership survey to its 450 members looking for feedback on its services and the challenges of the current business climate. During the following 2 weeks 153 responses were received through Survey Monkey. To the question “Is your Chamber membership of good value to your business?” 92% Agreed or Strongly Agreed. The 4 biggest challenges faced by responding businesses were: Obtaining New Customers 30%, Hiring Qualified Candidates 19%, Payroll Taxes 14% and Government Regulations 13%. The significant thread throughout the majority of responses is that Chamber members value the connection and relationships made with other Chamber members the most. Among the Chamber’s priorities are partnering with area businesses and Visit Buffalo Niagara to drive tourism traffic for merchants and leading collaborations between businesses and our local school districts to address workforce development needs. The Chamber board of directors is continuing to evaluate these responses and the many comments received and will reach back out to members who had questions or wanted to be contacted by a Chamber representative. The Chamber will then use this information as it continues to meet members’ needs and while also continuing its work in playing a significant role in helping to shape the growth of the Greater East Aurora community. 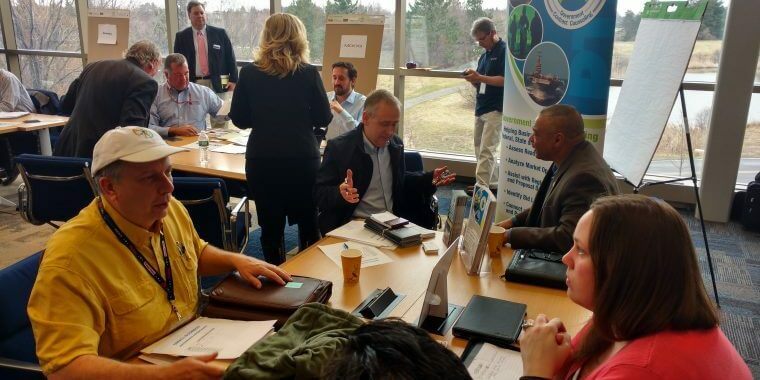 Chamber Meetings Continue to Connect Local Businesses! 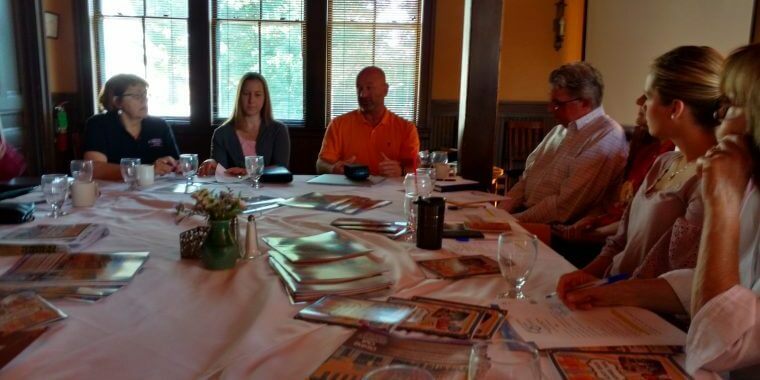 If you weren’t at the Roycroft Inn for the Greater East Aurora Chamber of Commerce’s Business Tourism Council meeting this morning (6/21), you missed a very informative and energizing get together. There was a strong turnout to hear presentations by developer Todd Stine, new owner of 649 Main St. (the former First Niagara Bank) and John Cimperman, owner of 42 North. Mr. Stine talked about his plans for developing his property into a 9 room Air B’nB and an events center featuring the former bank’s unique architecture. Mr. Cimperman discussed the planning and concept for the Borderland Festival at Knox Farm State Park September 22nd and 23rd. The festival will feature nationally recognized bands on 3 stages along with local artisans, craft beers and foods and more. In addition, group discussion centered on area activities and events, tourism promotion and local business updates! Join us for the next meeting July 19th!